This hour-long drama was based upon the 1966 film of the same name, adapted for television by one of the film’s producers, Carl Foreman. 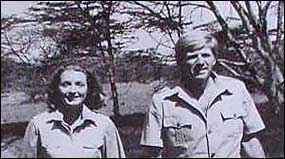 The show was based upon the lives of George and Joy Adamson, a husband-and-wife team who worked as game wardens in East Africa. Born Free was shot on location in East Africa and followed the adventures of the Adamsons as they guarded the wildlife in their designated area. They were assisted by scout Makedde as they fought off natural disasters and dealt with poachers. The show also had a regular animal character in Elsa, a lioness. Both the television show and the film were inspired by Born Free and Living Free, two non-fiction books by the real Mrs. Adamson. The show was cancelled in December of 1974 after 13 episodes. But if it makes you feel any better, the show died like it lived: free.